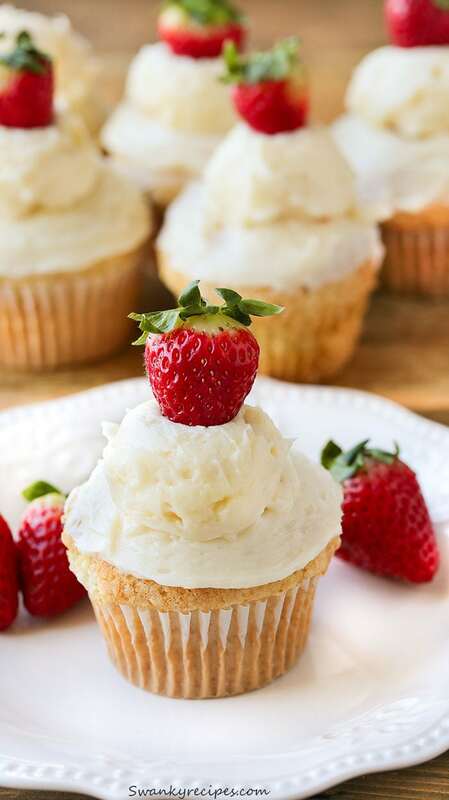 Classic southern Strawberry Shortcake Cupcakes with a surprise strawberry stuffed inside with American Buttercream frosting, strawberries in syrup and a strawberry top. This frosting will withstand the heat and hold up. 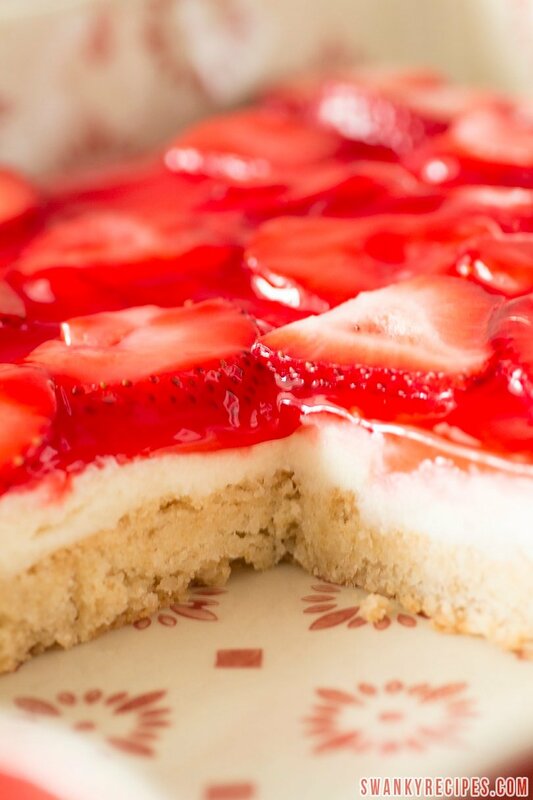 Strawberry shortcake is the classic summertime and springtime dessert. I grew up eating this classic dessert and look forward to baking it when it starts to heat up outside. Every year, our family would get together and strawberry pick in the farm fields of Wisconsin. After our gigantic strawberry haul, mom would make a batch of strawberry shortcake and homemade strawberry jam. 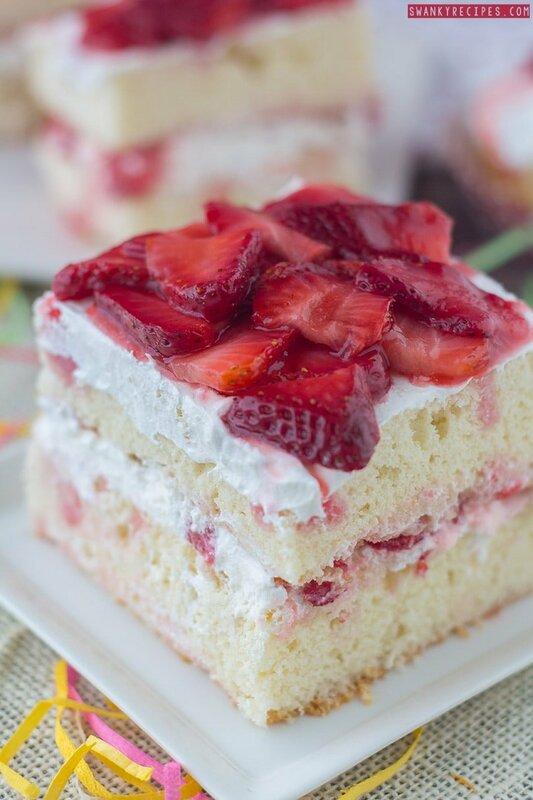 This recipe is actually adapted from my Strawberry Shortcake recipe I made last year. Because that recipe is such a hit, I wanted to extend it to cupcakes. Because it gets so hot out in the summer, I wanted to make a frosting that would withstand the summer heat of New Orleans. Even with the air at 66 degrees in the house, traditional whipped cream frosting melts into a big hot mess. Therefore, this recipe uses an American Buttercream recipe which withstands the heat. In fact, after frosting the cupcakes, just pop them into the refrigerator for a little bit to allow that all that butter the chance to harden again. To make this recipe, start by mixing the flour, salt, baking soda and baking powder in a separate bowl then set aside. Cream the shortening and sugar together in a large bowl fit with a mixer. **Room temperature butter may be uses as an alternative. Just be sure to use equal amounts of butter in place of the shortening. Next, add the eggs and vanilla extract to the batter. Slowly add the dry ingredients to the wet ingredients, 1 cup at a time. Alternate adding the milk and flour mixture until the batter is mixed. Bake in a 350 oven for 30 minutes or until a toothpick inserted into the center comes out clean. Allow cupcakes to cool completely. What makes these cupcakes great is the surprise strawberry hidden inside the cupcake. To do that, simply cut the stems 18 strawberries. 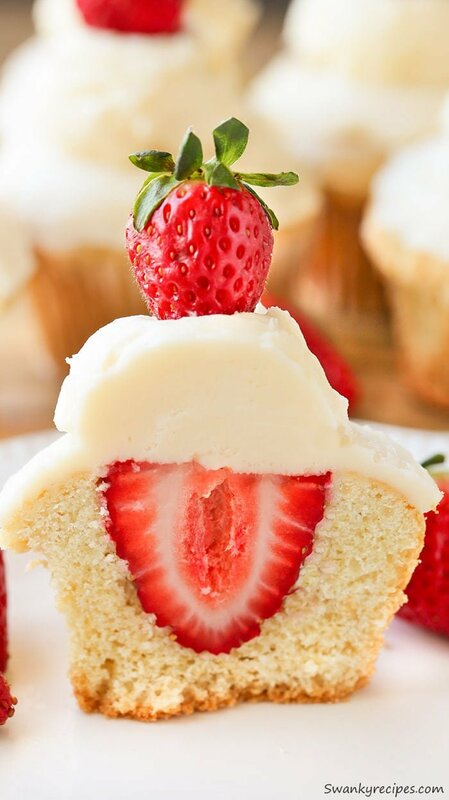 Size each strawberry up to the cupcake and using a sharp knife, gently carve a hole for the strawberry to fit. Stuff a strawberry in each hole. Next is the frosting. This frosting is amazing, by the way! It’s silky, creamy and delicious. Not only that, but it melt on top of the cupcake like whipped cream. This frosting recipe uses a lot of butter, three sticks to be exact! But I promise, the frosting is delicious and there are a lot of cupcakes to frost. Start by creaming the butter together until light and fluffy. Mix in the powdered sugar, beating until light and fluffy. Add the vanilla extract and salt to the mixture and continue to beat it. Depending on the thickness of the frosting, mix in some heavy cream. This frosting can be refrigerated, however it gets incredibly lumpy and will need to be beat in a stand mixer again, which kind of softens it anyway. To frost the cupcake, use a spatula and spread a little frosting on each cupcake. Next, using a cookie scoop sprayed with cooking spray, scoop frosting onto each cupcake. Be sure to grease the cookie scoop each time, then just top the cupcake. Next, top each one with a small strawberry. Refrigerate for about 30 minutes or so and the frosting will harden some. Top with strawberries in syrup if desired. I made my own with fresh cut strawberries in a saucepan with a sugar and a little water. However, store bough strawberries in syrup may be used. What are some of your favorite childhood recipes? Preheat oven to 350 degrees F. Line a cupcake pan with cupcake liners then set aside. Cream shortening and sugar for 1-2 minutes on medium low speed. Reduce speed to low and add in 1 egg at a time. Add vanilla extract and continue beating until mixed. 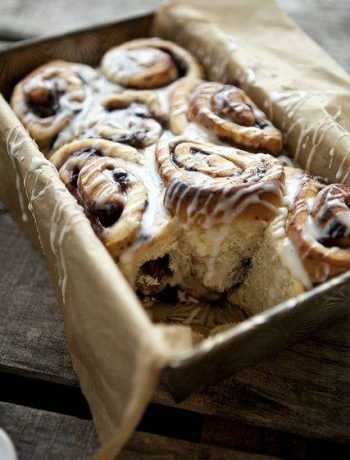 In a separate bowl, combine flour, salt, baking powder and baking soda and whisk together; set aside. Slowly add dry ingredients to wet ingredients alternating with milk on low speed. Incorporate well. Batter will be thick. Scoop 1/4 cup cake batter into each cupcake liner. Smooth tops with spoon and bake for 30 minutes. Once the cupcakes have cooled, take a knife and carve out a little cupcake in the center to fit the strawberry in. 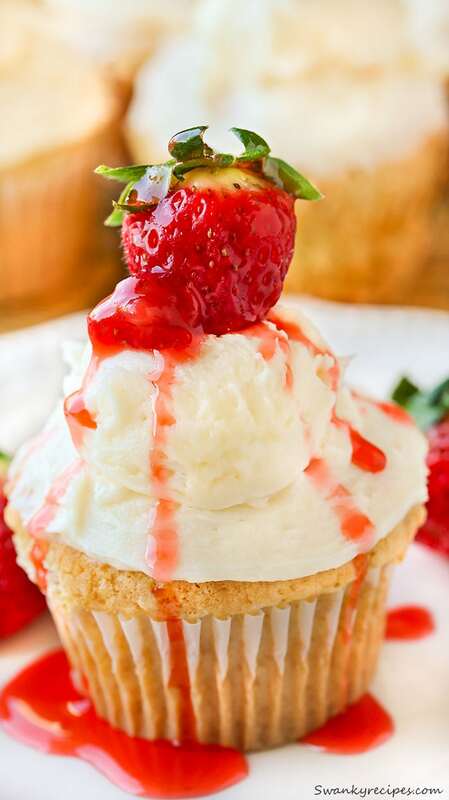 Remove the top greens of each strawberry that will fit inside the cupcake. You can keep the tops on the other 18 strawberries that will be placed onto of the cupcake frosting. 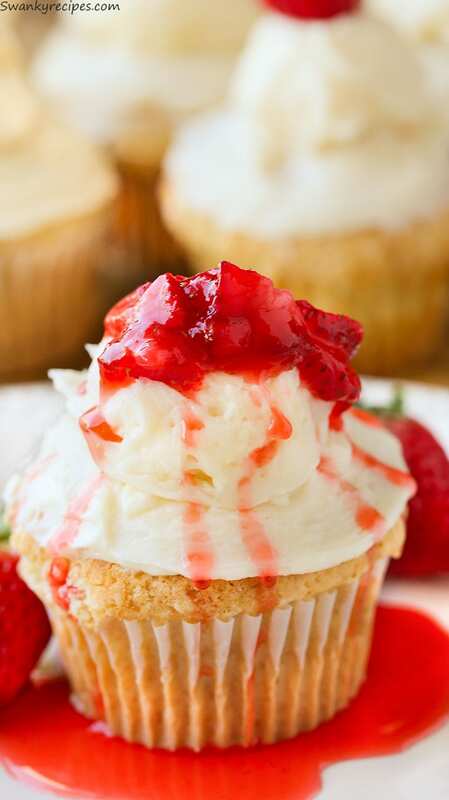 Fit the 1 strawberry in the center of each cupcake or you can use strawberry in syrup to fill the centers a little but be careful not to overload it with syrup as it may leak. To make the frosting, beat the butter in a mixer fit with a paddle until light and fluffy. Add in vanilla extract and salt then slowly add the powdered sugar to the mixture. Beat on high speed for 3-5 minute until light and fluffy, adding heavy cream to thin it out. To frost the cupcakes, use a spatula to spread a little frosting on the cupcake. Then use a cookie scoop to create the dollop in the center. Spray cookie scoop with a little cooking spray in between each scoop then fill the scoop and press it against the side bowl to create a flat bottom. Place in the center of the cupcake. 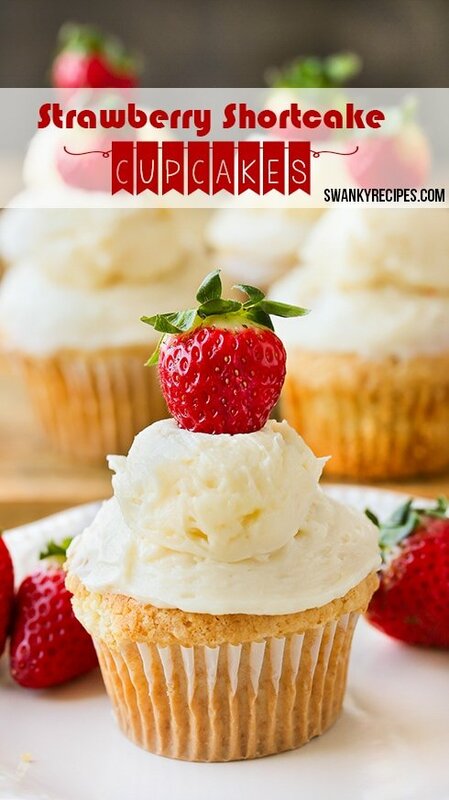 Place a strawberry on the top of the cupcake into the frosting slightly. If the frosting cannot hold the cupcake, refrigerate cupcakes to harden frosting. Cupcake frosting will harden in the fridge just like butter but a lot softer and not as hard. It will hold it's shape on hot summer days. *To make strawberries in syrup for a topping, cut up a bunch of strawberries and place them in a saucepan over medium low heat on the stove top. Add some sugar and water. Allow mixture to heat and adjust adding water or sugar. Allow to cool before topping the cupcakes with the syrup mixture. For a quick alternative, use store bough strawberries in syrup. 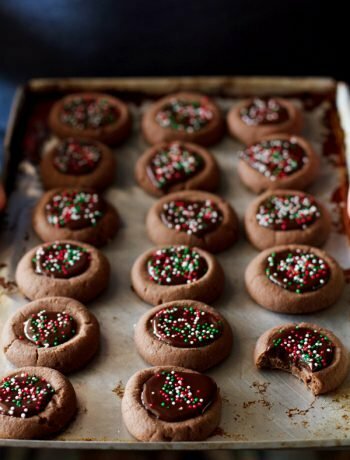 I love the tip about using a cookie scoop for the frosting – makes things easier! Love it too, It took just a few minutes! First, I LOVE the pictures. The idea of stuffing the strawberry in the cupcake is adorable. Do you have a strawberry jam recipe? Almost too cute to eat but so worth it! Thanks, Sam! I love the idea of the strawberry inside the cupcake. Looks great and I bet it tastes great too. 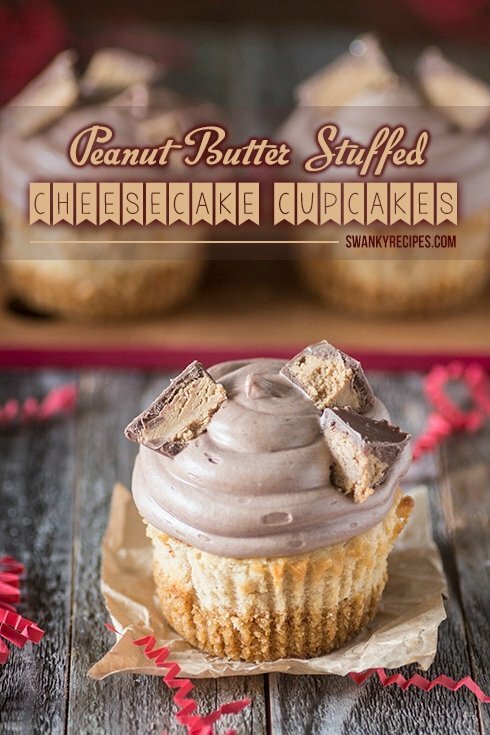 My new favorite cupcake recipe! Thanks, Mark! These cupcakes are perfect for strawberry lovers! I love the ones in the centres, looks so pretty! 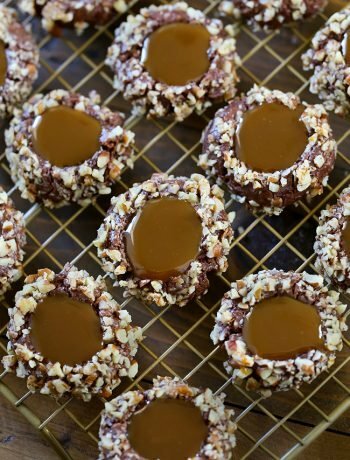 These look SO GOOD, Jessica! I love how you put a whole strawberry on top, too. The inside looks amazing and makes me want a shortcake cupcake now!